All bookings for these facilities will be taken through Mrs Rosemary Lewis, tel. 01934 742656 or 07397 806319. The current hire fee is £10 per hour or part hour with a charge of £25 per morning, afternoon or evening session of three hours. Potential clients can check the availability of the Church Hall and the Classroom by visiting the Hall Bookings webpage. Hire fees are payable in advance for all new bookings, unless by prior agreement with the bookers. Clients are expected to leave the Hall and Classroom in a clean and tidy condition, also the Kitchen, if it has been used. All chairs should be stacked neatly, away from the radiators. Any furniture or equipment used must be returned at the end of a session. If these are moved from one hall to the other, they should be returned to the correct hall. There may be an additional charge for use of cooking facilities. This is to cover electricity, water and sewerage costs incurred. No charge will be made for use of the kettle or microwave only. The user of the Hall is responsible for ensuring all heating, kitchen equipment, and lights are switched off at the end of a session. The Halls must be locked and the windows secured. Equipment from the Hall may be borrowed for a small fee by prior arrangement. It must be signed out and back in at the end of a hire period. A book is available in the Hall for this purpose. Any problems with the equipment or Hall cleaning should be reported to Rosemary Lewis at the above number. Payment of Hall and Classroom fees can be made by cheque or cash to Mrs Pat Moon, Holly Cottage, Barrows Road, Cheddar, BS27 3BD until 1st January 2015. After that to Mrs Rosemary Lewis at Wynfield House, Lower North Street, Cheddar, BS27 3HH. Please do not send cash by post. 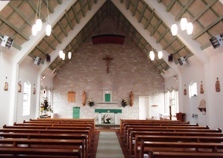 Cheques should be made payable to Our Lady Queen of Apostles Church. All envelopes containing money should be clearly marked with the name of the hirer or organisation.